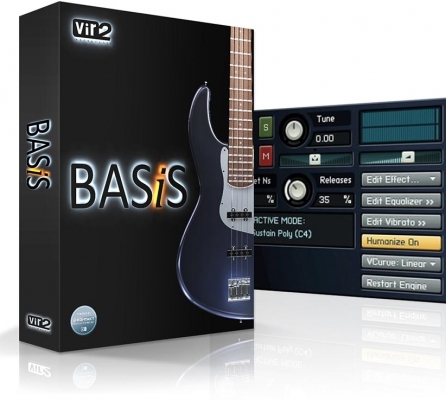 Become master of the low end with BASiS, a breakthrough virtual instrument from Vir2 Instruments. Featuring a comprehensively sampled collection of electric, upright, fretless, and synth basses, BASiS offers incredible attention to detail in the depth and breadth of the basses: 24-bit sampling, DI and amp blending control, multiple velocity layers, seamless humanizing, custom legato and vibrato tools, release layers, harmonics, hammer-ons, pulloffs, slides, slaps, rakes, falls, and more. BASiS includes more than 7 GB of the most diverse collection of basses available in the world of virtual instruments: classics like the Jazz Bass, P-Bass, Rickenbacker, and Musicman basses are presented alongside personality and genre tributes such as a classic Motown bass, a gospel bass, Jaco’s Fretless, and Macca’s Hofner. One upright bass and three slap basses are also included. In the synth bass category, more than a hundred patches are provided, ranging from thumping vintage synth basses to techno basses and esoteric fresh creations to spice up your tracks. Each instrument has been meticulously mastered and programmed for maximum musicality when placed in a mix. All electric basses have been sampled from both the direct input (DI) and an amped perspective. A knob on the interface allows phase-aligned blending of the two, or the selection of one or the other. For the upright bass, the same knob allows mixing of the direct input and a phase-aligned tube mic output capture of the same sessions. Other onscreen controls allow pitch bend range adjustment, pick noise and fret noise controls, release layer controls, adjustable velocity curve, and instant and detailed control over EQ. A comprehensive selection of effects is included, including an octaver, compression, saturation, lo-fi, distortion, limiter, phaser, flanger, chorus, reverb, and delay. Performance features include an innovative legato tool designed for true finger-smooth playing, and a customizable vibrato engine with control over vibrato types, speeds, and depths. Rather than opting for traditional LFO-based vibrato, BASiS uses a sophisticated character vibrato modeled after real bass players, completely controllable from the keyboard and onscreen interface. Randomized pick noises, release samples, and fret noises add to the realism of each instrument. Combining all of these innovative features into one virtual instrument, the end result is a versatile, varied, and intuitively playable library of the finest low-end instruments in the world.